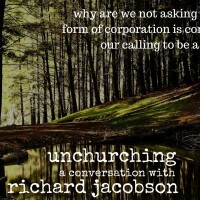 My guest today is Richard Jacobson who is a former pastor turned artist, animator, and now author. His book Unchurching: Christianity without Churchianity is written for the millions of Christians who are leaving organized churches. They aren’t alone and in Richard they may have found a leader. You may expect that someone writing against the current structure organization of churches to be bitter and angry at the church, with an axe to grind because they were hurt at some distant point in the past. Richard’s heart is not that way at all. I once heard a professor say to a class on church leadership that if you want to criticize the church, go ahead, but make sure you love her first. Richard’s heart is 100% there. He loves the church and believes there are better ways to create disciples than the present corporate structures. When the Holy Spirit speaks, he speaks with power. Wouldn’t a God who is omnipotent and omniscient that can do anything, be able to make you know [when His presence is near]? It’s kind of a backwards idea to think that the starting place for entering into a relationship or having an encounter with God is external when He’s God with us and we are His temple. We’re talking about a very internal thing. We are talking about the indwelling presence of God. Of course it makes sense that it would start with something happening inside you. In the show we talked about Richard’s videos which are so fun. He uses them to share his views. You can find his YouTube channel here and the one we talked about called Is Church Leadership Backwards? Check them out for a very good-and entertaining-explanation of Richard’s ideas. Why are we not asking whether this form of corporation is consistent with our calling to be a community? Get the Unchurching Podcast, too! 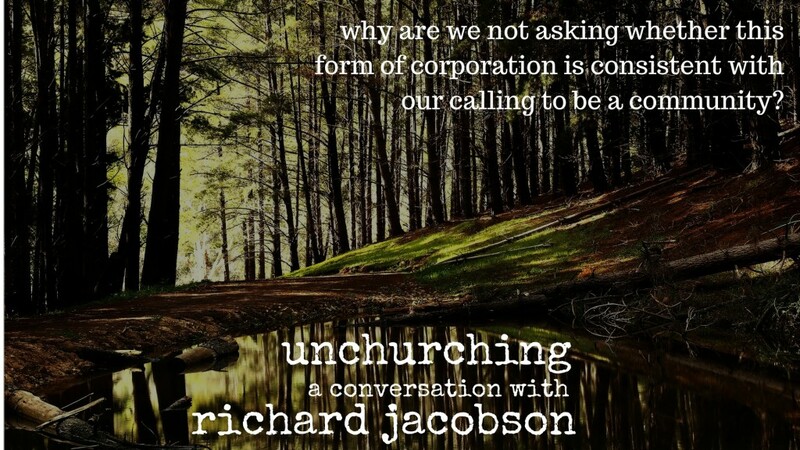 Did you enjoy hearing Richard’s story about unchurching? If so, be sure to stop by iTunes and subscribe. While you’re there leave a review which helps our visibility in the rankings.